Former Aggie great Jaycee Carroll, recently rated as one of the top three American players in the European Cups, dropped a team-high 26 points on CB Canaria in a thrilling come from behind victory today. Carroll contributed 6 three point shots and sever clutch buckets down the stretch to erase a 12 point deficit with less than 3 minutes remaining. Check out the highlight video on the Official Real Madrid website and read the full game writeup. Use the Google Chrome Translate Feature if you aren’t fluent in Spanish. Wow… 12 points down with three minutes remaining? Reminds me of the furious comeback that Jaycee contributed to against Boise State in 2007. Another one of Chaz Spicer‘s epic game winners. After hearing that Bobby Wagner set a Seahawks record for most tackles in a single game by a rookie with 14 tackles against the New England Patriots (no other Seahawks rookie has ever had more than 10), I said to myself “I would sure love to see a highlight film of that”. Well, I decided to take matters into my own hands and went ahead and created one. If you prefer an HD experience, click the video title to go to youtube, change the settings to 720p and watch it full screen! Bobby in a half shell…. TURTLE POWER! Who is your favorite current Aggie Football player? Why? What is your favorite all-time Aggie Football memory? What makes you an Aggie, and why should you win this contest? A committee will read the stories and select a winner based on the best/most interesting story on Friday morning. Aggie Basketball Is Upon Us! It’s been a while since we’ve had a basketball-related post on here, but I figure it’s about time to catch up. 1 – The 2012-13 Summer Prospectus was finally released giving us lots of good info on the upcoming season. 2 – Practice has begun. 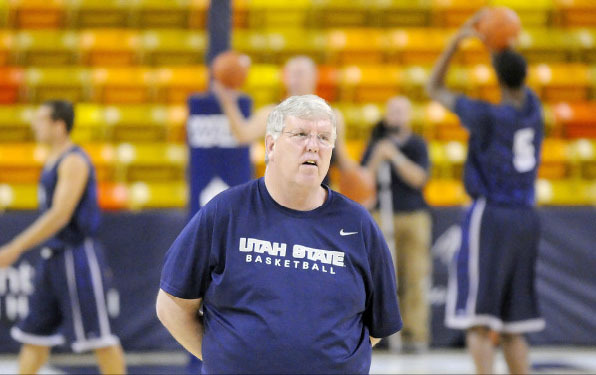 There is a good writeup on the Official Site with quotes from Coach Morrill, and Preston Medlin. The consensus? Everyone is excited. We’ve got a lot of new faces, and a lot of potential, but no one knows exactly what to expect at this point. It sounds like Stew is excited to see how the pieces will fit this year. 3 – The team photos have been taken and the USUStats.com Pictorial Roster has been updated with the new pics! Not only were the pics updated, but for the first time since this site has existed, there was no shrinkage on the basketball team. And no, I’m not talking about George Costanza shrinkage. I’m talking about the Utah State University height shrinkage phenomenon that we have had for the last several years. Every year recruits and sometimes even current players shave an inch or two off of their height when they receive their official listings. So what changed from last year to this year? Two players put on some weight. Ben Clifford added 5 pounds to weigh in at 220, and Danny Berger put on THIRTY POUNDS. Can this be right? Last year he was listed at 6-6, 175. This year he’s at 6-6, 205. From what I hear, Danny has really been tearing it up this off-season on the court, so I can only expect that this is good weight. With practice underway, the team will have a full week to try to learn some plays and get ready for the annual Blue-White scrimmage in the Spectrum.